UPDATE:The Baltimore Sun has an article about Loch Raven singletrack with inaccurate portrayals of MTBers by a city official. We need people to send email NOW! Details here. More info below about saving Loch Raven singletrack via my team mate and �ber trail advocate Eric Crawford. Get on it! REI, MORE and IMBA are hosting a public meeting on Monday December 14 at 7PM in the back room ( warehouse ) of REI's Timonium store. We will be updating the public on the days events. What events? Haven't you heard? The City has begun pushing people off the singletrack and fireroads around Loch Raven! Please attend for the latest news and to get answers to your questions. Website of a local user with the latest info. Threw my hat in the ring for the Board of Directors (MD @ Large) for local trail advocacy group MORE. Voting ends on the 10th, voting is open to MORE members. Aren't a member? Join today, whether you vote for me or not. Vote here. Thanks! Some of my earliest MTB memories are from Loch Raven reservoir, a great network of trails near Towson, MD. I don't get out there as much as I would like these days, but when I do it always puts a smile on my face. Problem is, a decade long ban on singletrack riding that has never been enforced has suddenly reared it's head in the form of warnings and tickets. Read about it in the City Paper here, then read the IMBA action alert below and send in your comments. Ask Baltimore Mayor Shelia Dixon and the Baltimore City Council to work more closely with mountain bikers. We have ridden the trails at Loch Raven Watershed for years, yet an abrupt change in management policies has recently been imposed on our user group, with no opportunity for dialogue or collaborative problem solving. Recently the Department of Public Works Reservoir Natural Resources Section Police officers have begun ticketing and fining trail users in Baltimore's Loch Raven Watershed. These fines have come without warnings nor an attempt to create a dialogue with the user groups who have been responsible for maintaining the resources for the many years. Many similar areas in Maryland and other Mid-Atlantic States welcome trail users as vested partners in management who will quickly alert authorities if something is amiss. At Loch Raven, the lack of adequate storm water management threatens the quality of the watershed, yet trail users -- who volunteer to maintain trails and remove trash -- are receiving tickets. - Immediate suspension of ticketing and fining trail users. - Creation of a map and signage on the existing network. - Begin treating all trail users equally and ensuring all maintained trails are open to all users. - Implementation of a night riding program, similar to agreements the Mid-Atlantic Off-Road Enthusiasts (MORE) has with Maryland DNR and other land mangers. - Creation of a trail maintenance agreement between the City and trail users groups, similar to agreements MORE has with Maryland DNR and other land mangers. 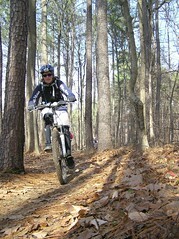 - Implementation of the "annual review of mountain biking activities." The Loch Ravenmanagement plan called for this, yet it has never been executed. Please take action on this important issue!